A sofa table with removable mattress. Making it cosy for the ones that enjoy lying under the table. In collaboration with Anna Kraitz, www.kraitz.se. 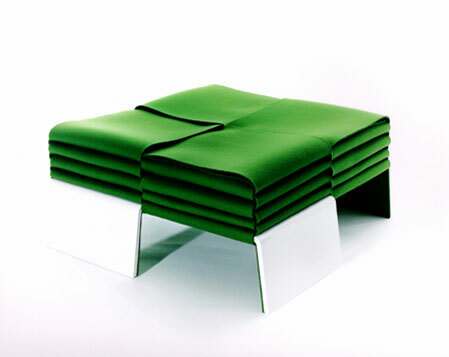 Material: Lacquered wood with an upholstered mattress. Dimensions (mm): W600, D1050, H430. A desk literally throwing itself into the waste basket. I like the idea of visualizing the cycle of trash and the possibility reusing trash in a constructive way. Material: Recycled paper reused in the material ‘wellboard’ consisting of a craft liner and a corrugated cardboard in between. The material is strong, recyclable and very light weight. The whole table weighs only 4kg. Dimensions (mm): W1200, D540, H750. 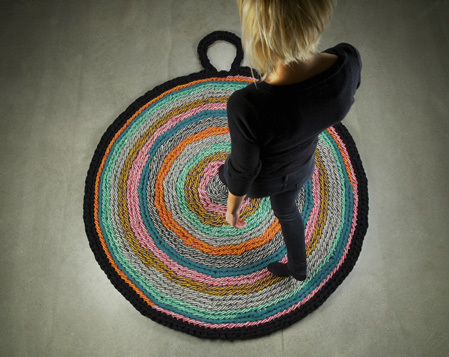 A rug designed by M-L Gustafsson & A-K Malmsten. 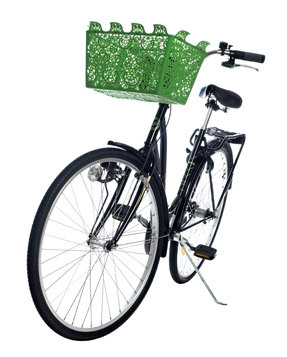 Carrie is a unique bike basket designed for the urban cyclist. Available at DesignHouse Stockholm, April o7. Designed to enable a free choice of length of the bench. 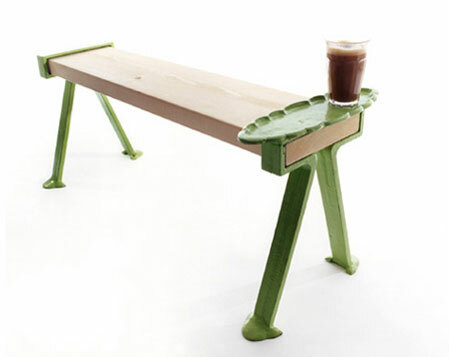 The leg pieces can be added as required according to the length of the bench, with or without a tray. 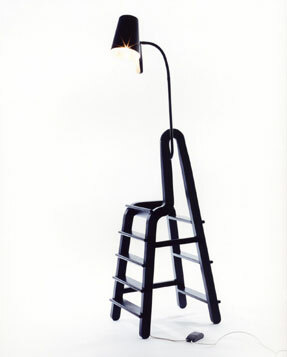 Material: Cast iron with a solid wood seat. Dimensions (mm): W variable, D240, H430. Through human interaction, the light changes intensity and form. The lamp is a collaboration with Andrej Håkansson, www.andrej.se. The product is in development by Quasar Holland. 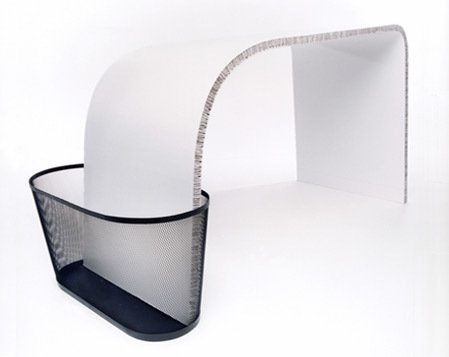 Material: Lacquered steel, elastic textile and LED. Dimensions (mm): W350dia, H variable 500-720. A fun way to clean! Material: Slippers with cotton scouring-cloth. An armchair that allows the user to feel special, with its richly coloured combination of polythene sheets forming a train. Experience the fascination of dressing up as a child. For a moment you can be a princess or a prince. Dimensions (mm): W700, D1200, H700. 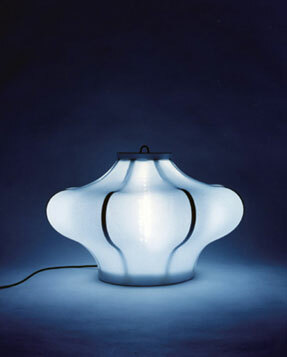 A lamp that projects stars, designed from the metaphor 'climb to reach the stars'. In collaboration with Anna Kraitz, www.kraitz.se. Material: Base in lacquered wood, shade in metal. Dimensions (mm): W400, D500, H1600. 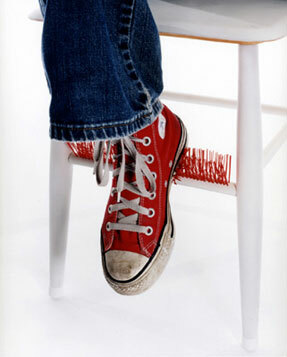 Sit down while clean your shoes. Material: Lacquered wood with a red brush. Dimensions (mm): W350, D350, H520. 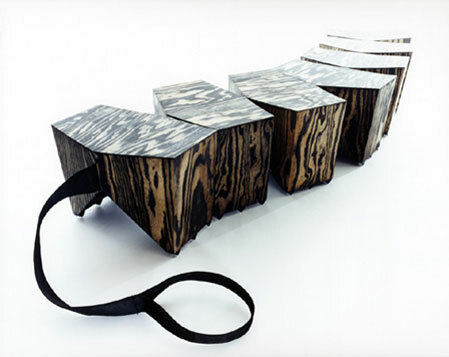 'Follow me' is a sinuous, segmented, centipede-like wooded bench mounted on tiny wheels and pulled by a fabric lead that follows the owner wherever they take it. The length can be adjusted by adding or detaching segments, providing a flexible, fully portable seating system for all ages. Material: Glazed pine plywood with a nylon strap. Dimensions (mm): W490, D330, H350 single module. ‘Slacker’ adds a new flexible sitting experience as its users have to find their own sitting position. 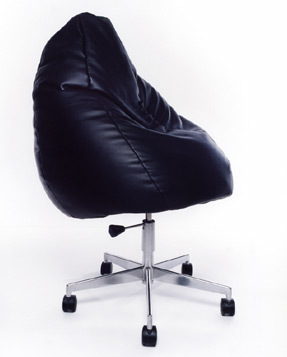 Material: Cast aluminium frame with a seat made of polythene pellets in a sack of imitation leather. Dimensions (mm): W650, D650, H900(flexible). Let your senses guide you: have a bath in front of the open fire, your favourite film or anywhere in nature, daytime or moonlight! 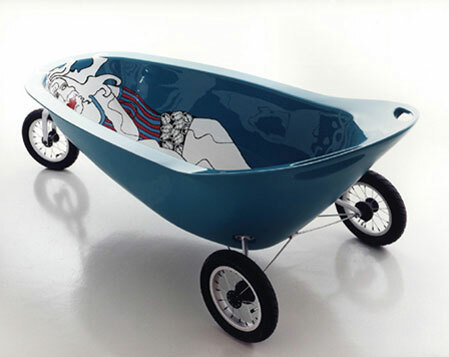 The project questions the location and personal value of the bathtub. Artwork by Norwegian artist Elin Melberg, www.elinmelberg.com. Material: Twin laminated GRP construction (glassfibre), for heat retention. Dimensions (mm): W740, D1730, H660. 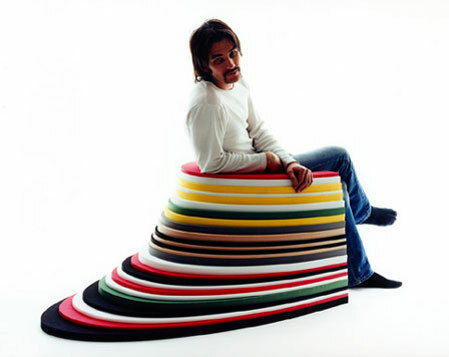 A stool made of plaited woolen felt. The technique is traditionally used in Sweden to plait birch bark but applied here at a different scale on a different material. Material: Lacquered plywood with felt in 100% wool. Dimensions (mm): W700, D700, H320.